Elsewhere: US Customs is investigating whether importers are evading duties on Chinese hardwood plywood; the BC Forest Safety Council says BC’s harvesting injury rate is the second lowest on record; West Fraser addresses a sawdust safety scare; and BC’s caribou herds are stabilizing where wolves are culled. U.S. Secretary of Agriculture Sonny Perdue held a listening session at Rex Lumber Co. in Bristol Friday morning with private forestry stakeholders and toured the facility. Florida Department of Agriculture Chief of Staff Matt Joyner, Florida State Forester Karles, Senator Bill Montford and many others were on hand to discuss with Secretary Perdue the damage Hurricane Michael has caused to the Florida Panhandle’s timber and agriculture industries. A major concern to farmers who lost their crops and the $1.2 billion loss to timber producers is the efforts being administered by USDA and the state in recovering from this disaster. The Whistler Naturalists offered the community its first glimpse of a forthcoming mapping project that has recorded old and ancient trees around the resort. Spearheaded by Naturalists founder and ecologist Bob Brett, the initiative is one of the most in-depth efforts to record and date Whistler’s trees. The Naturalists have photographed and cored hundreds of trees around the community, which will be displayed in a slick-looking map that is due for publication next year. At the non-profit’s annual general meeting on Monday, Nov. 19, Brett explained the project’s goal. “The reason for all of this and all the coring I’ve ever done is related to trying to conserve old-growth forest,” he said. With one year remaining for British Columbia’s controversial wolf cull, some caribou herds appear to be stabilizing in the province’s northeast. Wolves are being killed near four caribou herds in the Peace region. Three of those areas have had active wolf management since 2015. Since then, 480 wolves have been shot by contractors hired by the province, according to the B.C.’s Ministry of Forests, Lands and Natural Resources. 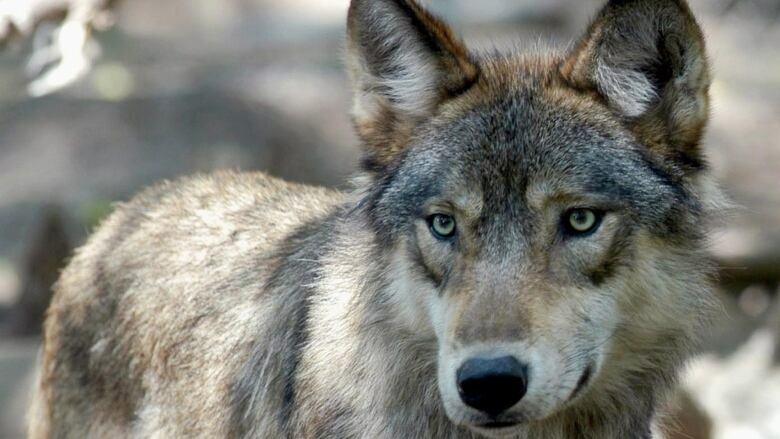 The province initiated a five-year plan to cull wolves in 2015. It’s aimed at saving the province’s endangered herds of mountain caribou by reducing the number of predators that feed off them. But the cull was controversial from the outset, even drawing the ire of pop star Miley Cyrus. Critics have argued that habitat loss and human encroachment are to blame for the decline of the caribou, and say there is little evidence to back up the theory that wolves are the problem. In 2001 the Liberal government introduced Professional Reliance to reduce red tape along with the civil service. For 15 years it was embraced by the forest industry but drew increasing criticism from competing forest resource users. As expected with a change in government in 2017 there would be a change of some programs introduced by the previous government. …The last professional reliance report that came out in the summer of 2018… and was requested because of concerns raised by a number of independent agencies. My impression from the reports is that while recommendations are around some of the problems pointed out by Ombudsperson, Forest Practices Board and Auditor General and others there does not appear to be a push for a return to the old level of government control. Within minutes of the deadly Camp Fire’s ignition, several acres were ablaze as fire spotters stood by helplessly. …Within two hours, the fire tore through the towns of Concow and Paradise before it raged on, claiming thousands of structures and dozens of lives. President Donald Trump and I both saw the devastation of the fire on our recent trips to California… California is a tinderbox. The ongoing drought, warm temperatures, insect infestations, poor forest management, continued residential and commercial expansion in the wildland-urban interface and other factors have made the western United States more prone to fire. …Every year we watch our forests burn, and every year there is a call for action. Yet, nothing gets done. Now Congress has the opportunity to pass good policy that saves forests and lives by including House-passed proposals for forest management in the Farm Bill. LOS ANGELES — A massive wildfire that killed dozens of people and destroyed thousands of homes in Northern California has been fully contained after burning for more than two weeks, authorities said Sunday. The California Department of Forestry and Fire Protection said the Camp fire had been surrounded by firefighters after several days of rain in the Paradise area. The nation’s deadliest wildfire in a century killed at least 85 people, and 249 are on a list of those unaccounted for. The number of missing dropped in recent days as officials confirmed that more people were alive. Crews continued sifting through ash and debris for human remains. The fire began Nov. 8 in the parched Sierra Nevada foothills and quickly spread across 240 square miles, destroying most of Paradise in a day. …Three people died, and 1,643 buildings, most of them homes, were destroyed, officials said. 1890s: Loggers complain that the Sierra Nevada could be more productive for timber harvesting if wildfire were suppressed. …1905: U.S. Forest Service is formed, unifying a number of forest agencies. …1930s: Critics of aggressive fire suppression argue that wildfire is an important part of forest health. …1960s: The effects of fire-starved landscapes become increasingly hard to ignore. 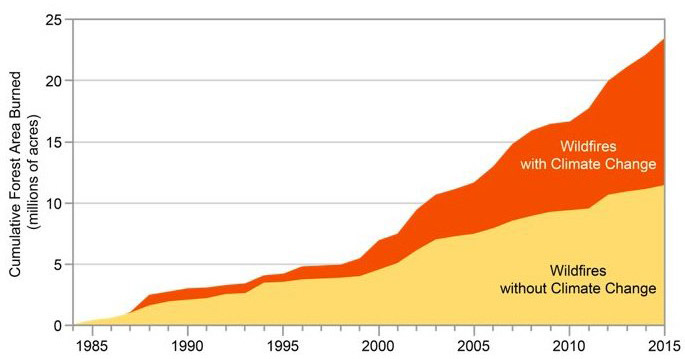 …1980s: Logging in federal forests reaches an all-time high. …1994: President Bill Clinton adopts the Northwest Forest Plan to dramatically curtail the logging of old-growth forests. …2001: Logging activities on federal forests fall to levels not experienced since the 1930s and early 1940s. …2003: Healthy Forest Act is signed into law by George W. Bush, streamlining environmental regulations to allow for targeted timber harvesting such as around backcountry communities. …2018: Gov. Jerry Brown issues an executive order calling for a doubling of targeted timber harvesting to address concerns about overgrown forests and wildfire danger. After the Camp Fire obliterated the town of Paradise this month in California’s most horrific wildfire to date, everyone from President Trump to Gov. 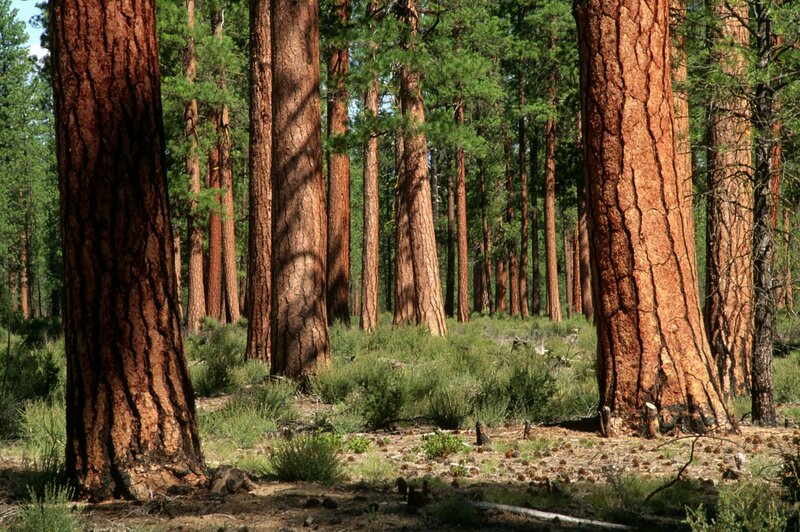 Jerry Brown raised concerns about the state’s overgrown and drought-stricken forests. 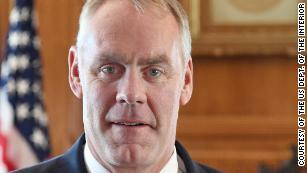 Both administrations called for a significant increase in logging on federal and private lands earlier this year to thin timberland characterized as tinderboxes ready to explode. However, according to research scientists and ecologists, wildfire’s increasing toll on life and property in recent years has been overwhelmingly driven by global warming and patterns of development — not the state’s most densely wooded areas. …On Tuesday, Trump called on congress to pass legislation that would dramatically expand the federal government’s authority to remove dead and dying trees as well as salvage logging following wildfires. 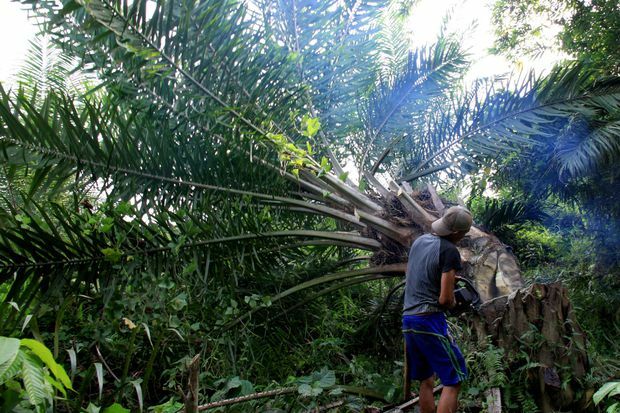 New rules to stop deforestation caused by palm oil production can only succeed if brands and consumers buy larger amounts of oil certified as green and ethical, industry officials and environmental activists said. The Kuala Lumpur-based Roundtable on Sustainable Palm Oil (RSPO), a global watchdog with more than 4,000 members including producers, traders, buyers and green groups, adopted a stricter set of guidelines at a meeting this month. The new standards include a ban on cutting down forests or converting peatlands for oil palm plantations, and greater protection for labour and land rights. …Under pressure to tighten standards from investors, buyers, retailers and even some large growers, the RSPO has faced the tough task of trying to appease members with different interests at a critical time for the industry. By 2020, Vancouver expects to be the greenest city in the world. But how does a visionary city continue to define the future of environmental sustainability? Vancouver and Canada should embed their local efforts into the new global negotiations for a global pact for the environment, expected by 2022 or so. This pact, featured at the Paris Peace Forum by world leaders earlier this month, will provide an international legal basis for environmental protection and environmental rights. Today… there is no global legal platform to ensure environmental rights. …What would a global pact for the environment do for British Columbians? Although COP21 was effective and unanimous, it was not legally binding and it only focused on climate change. …Legal protection of human rights to the environment at the global level will ensure that these resources are available for generations to come. The Fourth National National Climate Assessment report released Friday predicts that the Northwest will become drier and lose many of its subalpine trees to insects and wild fires in the coming decades. …“Changes in the timing of streamflow related to changing snowmelt are already observed,” the report says. …“The combined impacts of increasing wildfire, insect outbreaks, and tree diseases are already causing widespread tree die-off and are virtually certain to cause additional forest mortality by the 2040s and long-term transformation of forest landscapes. Under higher emissions scenarios, extensive conversion of subalpine forests to other forest types is projected by the 2080s.” By the 2080s, the median annual area burned in the Northwest is expected to quadruple from that reported in the 1916-2007 period to 2 million acres. At 2 p.m. Friday on the day after Thanksgiving President Trump’s administration released an important document about our climate. Required every four years by a 1990 act of Congress, the Fourth National Climate Assessment focuses on the human welfare, societal, and environmental elements of climate change. Surprising in its bluntness, it lays out the devastating effects on the economy, health, environment, and wildfires. …The scientists concluded that by the middle of this century, the annual area burned in the western United States could increase 2–6 times from the present, depending on the geographic area, ecosystem, and local climate. The area burned by lightning-ignited wildfires could increase by 30 percent by 2060. …Below are wildfire-related excerpts from the report. LONDON – Britain’s Drax has started a pilot project to capture and store carbon dioxide emissions at its biomass plant, the first of its kind in Europe, Drax said on Monday. Carbon capture and storage (CCS) involves the capture of emissions from power plants and industry to allow them to be stored underground or compressed in containers to be used for industrial applications such as making drinks fizzy. …Drax said using the technology at the plant in North Yorkshire, England, that burns biomass – wood pellets, often made from compressed sawdust – could enable the company to operate the world’s first carbon negative power station. …Drax said the CO2 will initially be stored on site but that eventually it will seek to find a use for the gas, such as in the drinks industry which earlier this year was hit with a CO2 shortage. Geraldine Manson, Snuneymuxw Elder, and Elder in Residence at Vancouver Island University, welcomed delegates at the 13th annual Vancouver Island Safety Conference to the traditional, unceded territory of the Snuneymuxw First Nation. …Rob Moonen, CEO of the BC Forest Safety Council (BCFSC), said he wanted to provide delegates with information about some of the industry accomplishments and some of the challenges in safety. Rob said the overall injury rate for harvesting in 2017 was the second lowest on record outside of 2009 (year of financial crisis and record low harvest levels). …Speaking from the heart, Minister Bains shared how he had worked at a Canfor sawmill and understood the many is- sues industry faces. He said that there had been both challenges and opportunities about health and safety at his time at the mill. The pulp mills are the likely source of the haze that settled over the Bowl area this morning, according to University of Northern British Columbia professor Peter Jackson. Jackson noted a light easterly wind and a spike in the reading for particulate matter at the Plaza 400 monitoring station, which jumped from about 17 micrograms per cubic metre at 10 a.m. to 61 at 11 a.m. “The high levels are most likely from the pulp mill area – a phenomena called ‘fumigation’ where there is a spike in air pollution levels in mid-late morning when the nocturnal inversion begins to break down and pollution-rich air mixes downward to the surface,” he said in an email shortly before noon. …B.C. Ministry of Environment air quality meteorologist Gail Roth confirmed Jackson’s assessment. A worker at the Chasm Sawmill division of West Fraser was buried to about head or chest depth in a wood shavings bin area and needed to be rescued, according to a WorkSafeBC report. “A worker performing clean up during maintenance type work inside a bin approximately 50 to 80 feet high, 30 feet wide, was engulfed by sawdust and/or wood shavings type recovery waste product,” according to the report. “The need for rescue did arise and the lone worker was engulfed and unable to self-rescue.” …West Fraser has since developed and performed a risk assessment, developed a safe work procedure for entering the shavings bin and as of Nov. 21 planned an emergency drill for confined space and/or enclosed space within the next 30 days.